From Amsterdam Airport (Schiphol) take a train to Rotterdam which goes about every 10 to 15 mins. One way ticket costs E9,- . The train will take about 45 mins. One can take a cab, but this will cost E100 or more. AHOY: This hall is very close to the Zuidplein metro station. From within the city this is a short trip with the subway. From station Zuidplein take Bus 75 or 157. 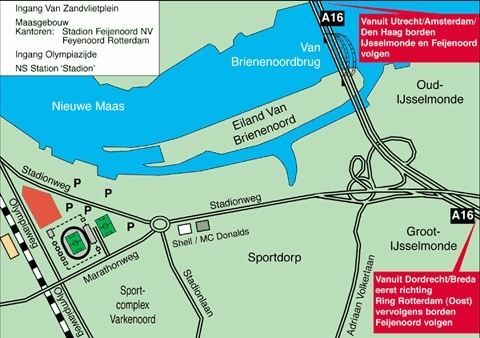 By car follow Zuidplein on the highway A15 on the southside from Rotterdam for Ahoy. 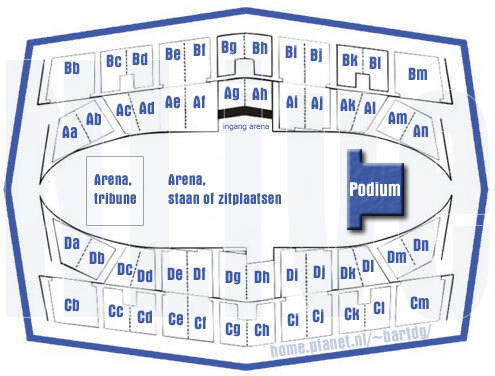 Kuip: The Stadion can be reached from the Central Station direct by bus number 49 or tram 2 23. By car follow the signs on the highway for the Kuip. There are many hotels. Go the the Stadhuisplein to the VVV office. This is for tourist information. If you really look for a hotel with style try Hotel New York it's about 20 min walk from de Kuip. It's between the South and North of the river the Maas. Another nice hotel is the Bazaar in the Witte de Withstreet. Stadhuisplein, the old harbor Witte de Withstreet. Nearby de Kuip there are a lot of bars. August 9 you have the dance parade it's really worth to see and hear this even if you like music like the Stones. If you got the time go on to see this. There is an afterparty on the southside. Thanks to Peter den Hartog and Jerrie Klaris for information!